Any Dota 2 fan will tell you that the second most exciting part of Valve’s annual Dota 2 International is the team shuffles which occur almost immediately after. In previous years these shuffles extended to months, sometimes several, after the International, but now with Valve’s roster locks in place for future Majors, teams are pressed for time bringing about some interesting changes. It hits all regions, and all fans, equally hard, but sometimes change is good. We’ve already discussed the major changes to Evil Geniuses, so it’s best we start there. After Clinton “Fear” Loomis announced his retirement last week, EG brought back Arteezy, Zai and Sumai, who left the team a few weeks before. They also brought in cr1t-, a newcomer to Evil Geniuses. The four new players joined long standing EG pillar UNiVeRSe with Fear staying on as the coach. 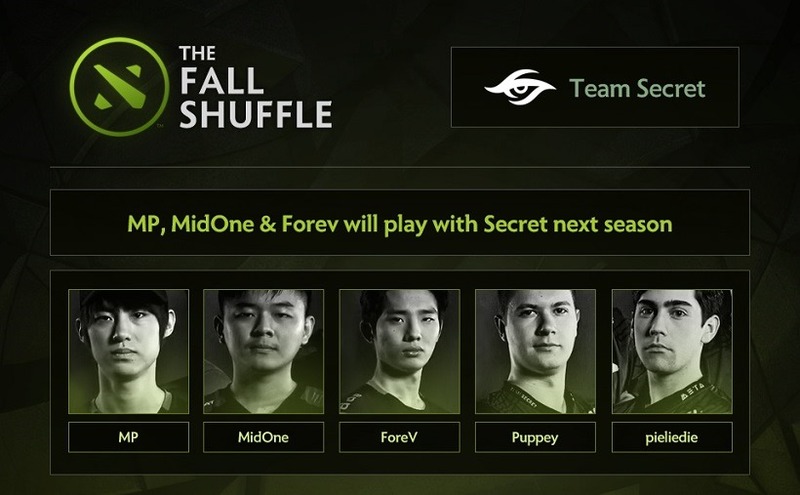 With the departure of Arteezy, Zai and EternalEnvy, Puppey now had to remake Team Secret, hoping to rise to former glory. To replace the three European players, Puppey looked to the east with the addition of MP, MidOne and ForeV, creating a rather interesting roster which will now compete under the Team Secret banner. Alliance’s roster went unchanged for the longest of time, with the hopes that they could one day win another International. Unfortunately, all good things must come to an end, and with the departure of s4, AdmiralBulldog and Akke, Loda’s Swedish powerhouse underwent a few changes. Limmp, Jonassomfan and Handsken will join EG and Loda for the next Valve Dota 2 Major. The Cologne Major Champions fell on hard times at the International as the star studded lineup struggled to progress through the playoffs. With two players remaining (Fly and n0tail), OG looked to the free-agents and brought in s4, JerAx and Ana. These are undoubtedly the most interesting changes to come from the “Post TI6 Shuffle” with other significant changes happening in almost every single region. For a complete breakdown of roster changes, a user made a great thread on Reddit with every change. Dota 2 artist Wykrm Reddy also created an album showcasing the changes, from which the above images were collected.